Nia Washington is the recipient of the Africana Studies and Business Services Dining Stipend Award. The Africana Studies minor was chosen for the award from a group of applicants based on her academic standing, community involvement and a personal essay. The UCF Africana Studies and Business Services Dining Stipend is an All Access 7 Dining Meal Plan Stipend for Fall 2018 and Spring 2019 semesters, valued at $3,960. Washington started her first semester at UCF this fall after transferring from Valencia College. The sophomore plans to attend law school but is studying English literature and minoring in Africana Studies while she pursues her bachelors at UCF. 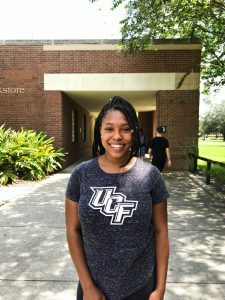 When trying to determine what she wanted to study while at UCF, advisors suggested that Washington prepare for law school by strengthening her writing skills with an English major. One of the advantages of following an English focused track is the ability to craft better arguments during and after law school. When it came declaring a minor in Africana Studies, Washington says that process started before becoming a Knight. For Washington, suddenly being presented with the history and information about her own people was one of her biggest eye opening moments. The more she learned, her desire to gain more knowledge continued to grow. At one point, she considered declaring it her major and making it her main area of study. Having such large portions of the African diaspora omitted from history lessons throughout middle and high school can frame the rich history of the continent and its people in a negative light for students. Washington says having a more complete picture that didn’t solely depict Africa as desperately impoverished nations has helped create a connection to her ancestry and minimize some insecurities. While she plans to graduate in 2020, Washington has her eyes set on attending law school at an Ivy league school.